Hi! It's Jilly. Do you have your Christmas tree up yet? We don't! The days since Thanksgiving have been flying by! I plan to get my Christmas decorations up today, though. It’s that time of year again! 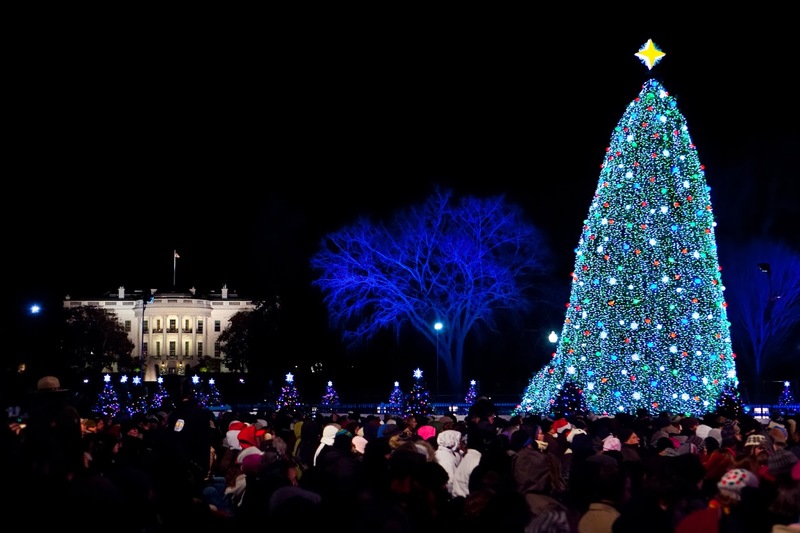 Bundle up for a spectacular winter wonderland treat during the 91st Annual National Christmas Tree Lighting ceremony brought to you by the National Park Foundation and National Park Service on Friday, December 6, 2013 at 4:30pm on the Ellipse at President’s Park in Washington, D.C. There to help kick off the holiday season and host the ceremony is the Emmy Award-winning actress, Jane Lynch. In addition to this talented host, there will be holiday performances by the talented Mariah Carey, The Avett Brothers, violinist Joshua Bell, Renee Fleming, multicultural trio Forte, the Queen of Soul Aretha Franklin, Janelle Monae, Latin superstar Prince Royce, jazz legend Arturo Sandoval, the pop group Train, Nolan Williams, Jr., and Voices of Inspiration. It will be a night to remember, with musical magic filling the air. This American holiday tradition was started by President Calvin Coolidge in 1923. The National Tree Lighting Ceremony couldn’t be as great as it is without its wonderful sponsors. For the sixth year in a row, UL is the premier sponsor of the National Christmas Tree Lighting. As a safety science company, UL’s goal is to promote safe working and living environments for all people. In addition, GE Lighting is celebrating its 51st consecutive year designing and lighting the National Tree. Other sponsors include Amtrak, Guest Services Inc., Hargrove, Hilton Garden Inn – Washington DC Downtown, Hudler Carolina Tree Farms, Loews Madison Hotel Washington D.C., Mesh Int’l, Nicolas Holiday, Uber, United and Willard InterContinental Washington D.C.
You can watch the 2013 National Christmas Tree Lighting online LIVE at www.thenationaltree.org beginning at 4:30pm, with the exclusive National Christmas Tree Lighting pre-show. In addition to viewing online, you can watch the event on public television throughout the month of December. Check out local listings or visit www.thenationaltree.org. Can’t wait until 4:30? Don’t forget to see what The National Tree is up to in preparation for the annual lighting by visiting www.twitter.com/thenationaltree! Sounds like so much fun! I'll have to check it out! Thanks for all the information, National Park Service!